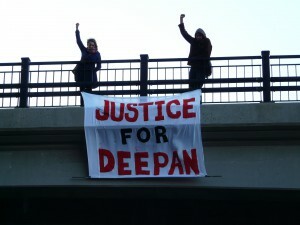 On April 9th, supporters of Deepan from Vancouver to Halifax dropped banners to support status for Deepan. Read press release here. Ottawa. 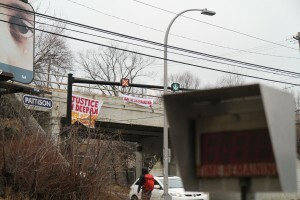 In Deepan Budlakoti’s hometown, Ottawa, concerned allies and friends of Deepan leafleted outside the Rideau Centre and unfurled a banner on the Mackenzie King bridge facing south bound traffic on Colonel By. Support for Deepan and the struggle to reclaim citizenship, has been growing and gaining momentum in the community since the campaign began last year. Toronto. 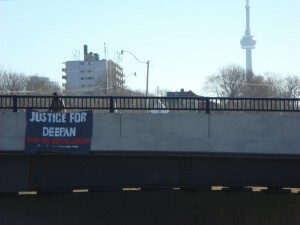 On the morning of April 9, 2014, members of No One Is Illegal – Toronto drop a banner over the Gardiner Expressway, demanding justice for Deepan and a stop to all deportations. The banner drop was one of many throughout Canada. London. 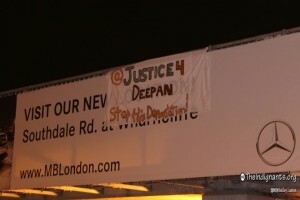 London says NO to the deportation of DeepanBudlakoti. 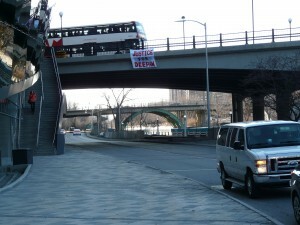 Our banner drop is on the north side of the Wellington/York bridge. 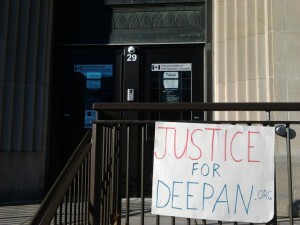 We believe the conditions enforced on Deepan are unjust and racist. This is violence enacted by the state. 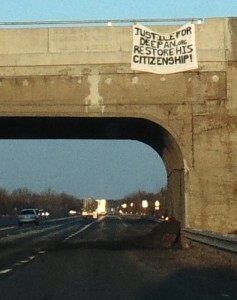 We demand that his citizenship be restored so that he can return to a life without fear or discrimination. We demand for his safety and his right to live his life. 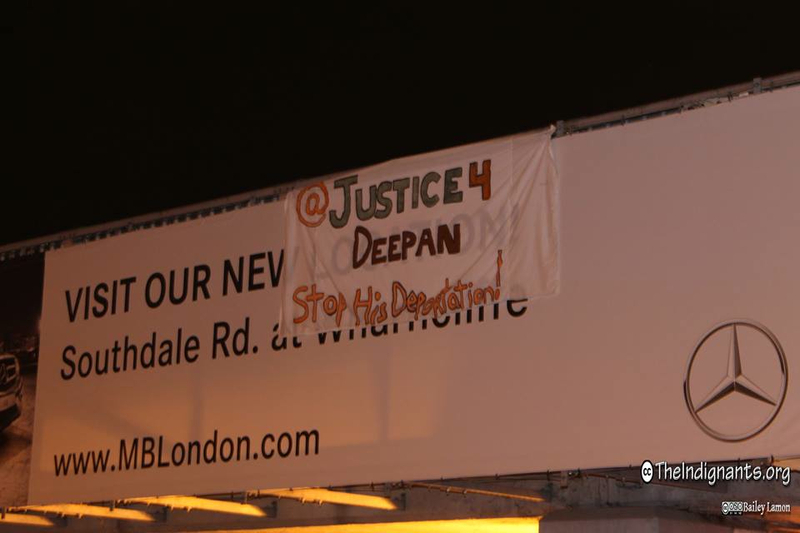 London is in solidarity with Deepan – NO MORE DEPORTATIONS. York. 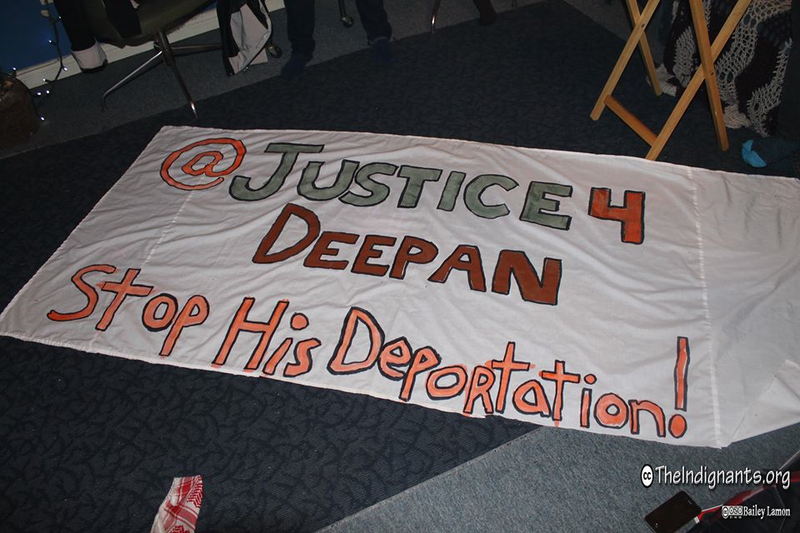 OPIRG York is supporting the Justice for Deepan Campaign to end double punishment, stop Deepan’s Deportation and restore his citizenship. We acknowledge that citizenship is a flawed system that grants privileges to a select few and is a part of racist immigration and border policies designed to exploit and marginalize migrants, as well as denies the rights of Indigenous peoples, whose land we occupy and Canada continues to displace. 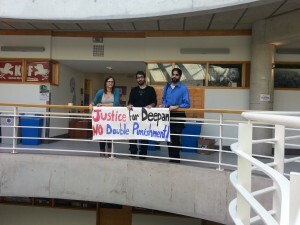 OPIRG York stands in solidarity with Deepan’s struggle! Montréal. 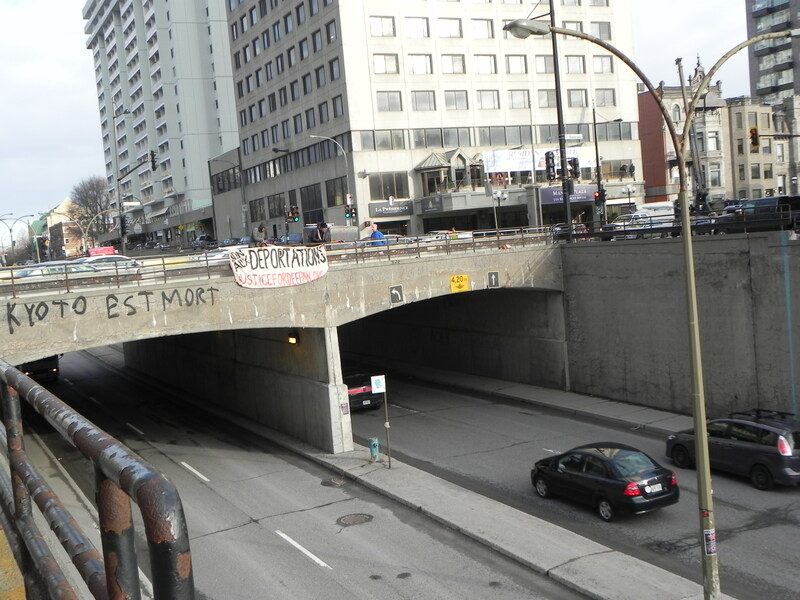 Members of Solidarity Across Borders dropped a banner in support of our friend and comrade Deepan Budlakoti during morning rush hour over Berri street in downtown Montreal. Kitchener-Waterloo. In Kitchener, the Citizenship and Immigration Offices, located on Duke St W. seemed like a good spot to show our support for Deepan, and help raise awareness about his plight. The sign we placed in front of the building on Duke st has plenty of foot traffic, and car traffic. People started noticing the sign immediately. Being born in Canada, but facing deportation adds another level of injustice to an already racist and flawed citizenship and immigration policy. 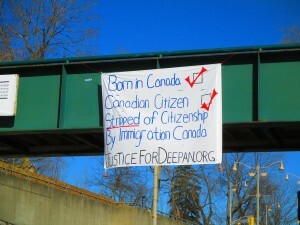 We call for an end to Deepan’s double punishment and a full restoration of his Canadian Citizenship. Justice for Deepan – Kitchener. St. Catharines. In St. Catharines 5 of us demonstrated in front of MP, Rick Dykstra’s office – former Parliamentary Secretary to the Minister of Citizenship, Immigration and Multiculturalism. 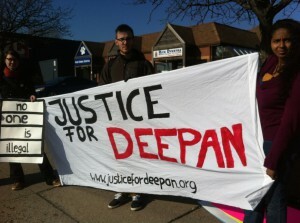 We demonstrated for a couple of hours, handing out postcards, stickers, and flyers letting people know about Deepan’s story. The cops were called on us once we stepped foot on their ‘private’ property, but after demonstrating we went into the office, where we were told Rick was in Ottawa and didn’t have an opinion on deportations and Deepan’s case – although they were familiar with it because they called him a convicted criminal. 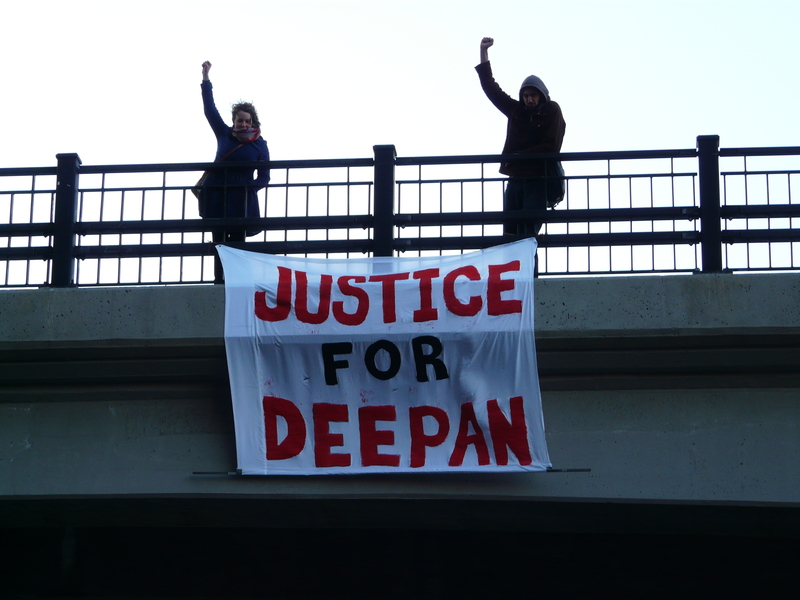 Deepan was generous enough to join some of us at the “Say No to Racism” conference at Brock University recently and we stand in solidarity with him and all others facing injustice from Canadian settler society. No one is illegal! Guelph. Guelph mobilizers drop banner in solidarity with Deepan Budlakoti’s struggle against a racist and anti migrant Canadian state. 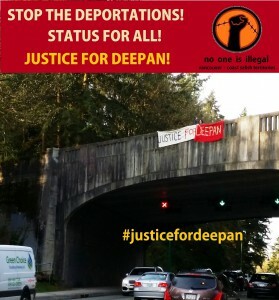 We act against the injustice of the double punishment being faced by Deepan and the prisons and borders targeting racialized and lower income individuals all over Canada. We mobilize in solidarity with Deepan as he fights for the return of his full Canadian status. Halifax. 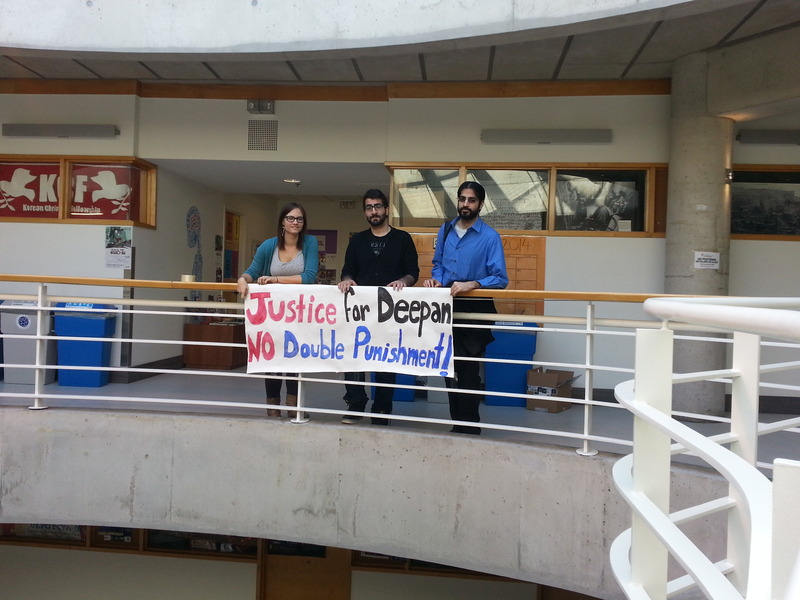 Halifax stands in solidarity with Deepan, calling for justice in his case and denouncing the double punishment he is currently facing. His potential deportation to a country in which he’s never lived in is an attack on citizens and immigrants from coast to coast! Vancouver. 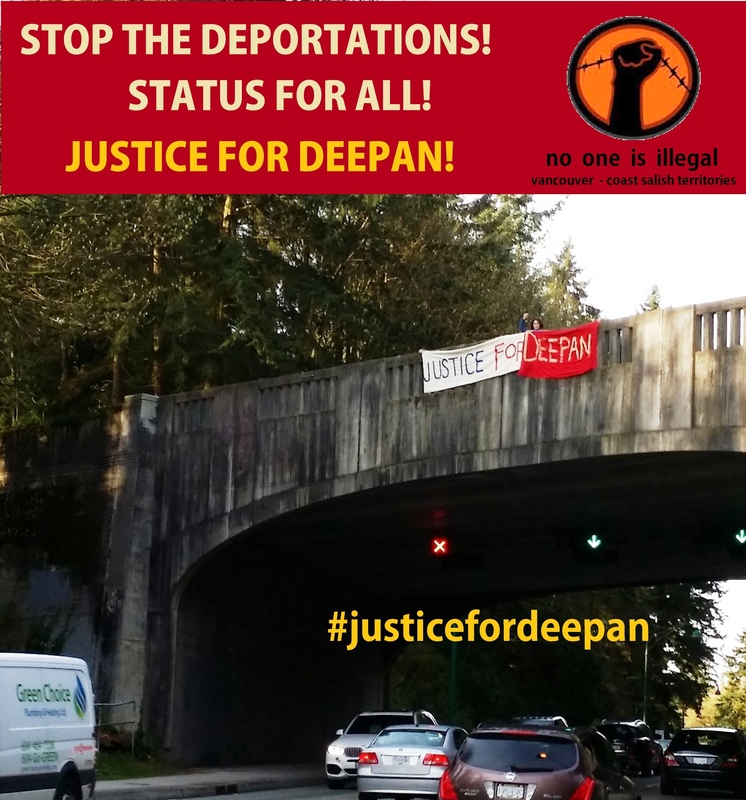 No One Is Illegal, Vancouver – Coast Salish Territories stands in solidarity with Deepan Budlakotin in his struggle for status and dignity. We fight alongside all migrant communities in resisting racist immigration policies and systems that exploit and dehumanize migrants. End to double punishment! Stop the deportations! Status for all! This entry was posted in Events, Support Photos on 09/04/2014 by admin.